Fact fluency still matters, but timed tests give students more anxiety than they develop students mathematical fluency. 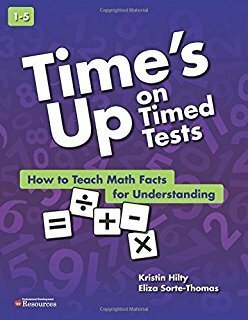 It’s time for educators to give timed tests a time out. But, what do teachers do as an alternative? This book is designed to be a resource for teachers to use with their students to develop fluency with math facts. It provides teachers with a wealth of practical ways to teach students the facts, help them understand the facts, and give them strategies to become fluent with their grade levels fact fluency expectations. The book covers fluency in addition, subtraction, multiplication, and division, with practical strategies for purposeful practice, including reproducibles of games and activities.